Fathom, Bar Harbor’s newest fine dining spot, elevates classic Maine fare to fancy food status with sublime flavor combinations. 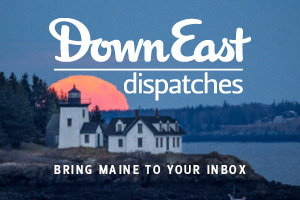 Heikkinen began working in restaurants while in college, starting as a dishwasher and working his way up in restaurant and catering kitchens, including August Moon in Bangor and Red Sky and Fiddler’s Green, both on Mount Desert Island. He was contemplating going out on his own when Tracey Hallett, another Maine restaurant veteran, began exploring the idea of opening a restaurant and sought his advice. A partnership was born. It was cemented when the location that held Maggie’s, a fixture in Bar Harbor for twenty-five years, became available. “The opportunities to move into a space that already had a great reputation as a successful fine dining restaurant are few and far between. It was the perfect place at the perfect time,” he says. Fathom opened its doors in the summer of 2011. The restaurant occupies a bright blue frame house on Summer Street, just steps off the main drag of Cottage Street. The décor is subdued, with neutral colored walls and white tablecloths. Rooms are small, but there’s also an outdoor patio, shielded from the road. 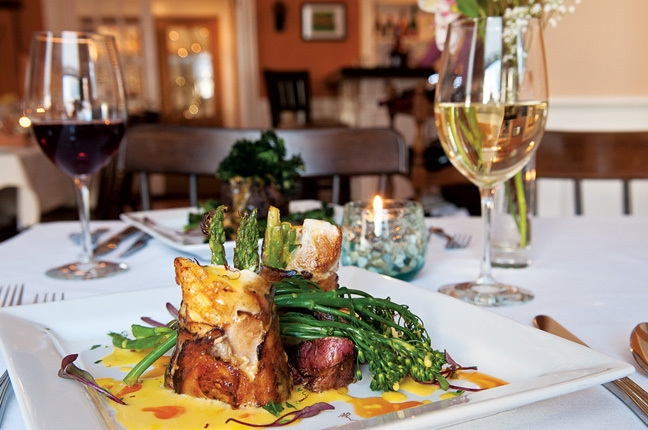 It’s fine dining, resort style: welcoming and comfortable, casual but with a hint of decorum. The pizazz is on the plate. While Maggie’s was renowned for its lobster crepes, Heikkinen is courting a following for his lobster and red “snappah” egg rolls, filled with lobster blended with grilled and ground red hot dogs, braised leeks, and cabbage. “It sounds so weird, but it’s so delicious,” he says. “That savory porky greasiness boosts the lobster’s flavor. They were made for each other.” Still, he acknowledges that it’s hard for restaurant guests to accept that they can be in a fine dining restaurant and order a red hot dog. Those who can’t wrap their tongues around the blend of lobster and frankfurters will find plenty to savor at Fathom. The first hint of updated Maine fare comes with the bread, a delicious swirl of anadama and focaccia paired with maple-molasses butter. “I wanted to go with pure anadama, a New England comfort food, but it’s too dense to start a meal with, so I decided to swirl it into focaccia,” Heikkinen says, adding that the maple and molasses play to the flavors in the anadama. Zucchini gnocchi sautéed with lobster meat and tomato in a butter parsley sauce is a signature dish. “Everyone coming to Bar Harbor wants lobster, and the challenge was to give it to them in a way they’d never had it before,” Heikkinen says. When fall comes, the dish morphs into sweet potato gnocchi with butternut squash, a sublime flavor combination. Local favorites include a grilled salmon with Maine chimichurri sauce, dilly beans, and dandelion greens accompanied by a golden glow pickle salad, and a Chateaubriand-style eight-ounce filet paired with a wild mushroom Béarnaise sauce and crispy kale. The flash-fried kale has become so popular, regulars order it as a side dish. Like the breads, Heikkinen makes the desserts, which might include maple anadama bread pudding topped with Mount Desert Island Ice Cream’s vanilla bean — it’s so good, you won’t want to share. Hilary Nangle is the author of the Moon guidebook series for Maine, including most recently Moon Coastal Maine. She writes the Maine Travel Maven blog.